Our FRAGILE stickers, with a glass symbol give a universally clear message. Produced in high resolution red and white, our rolls of warning labels can be used with an automatic label dispenser for added convenience – ideal for high-volume packing stations. Make sure your products and parcels get the careful handling they require during shipping or storage. Use these sticky labels with their highly visible instruction as a quick and easy way to mark up crates, cartons, moving boxes, mirrors or sheets of glass, for example. Permanently adhesive and non-fade graphics, our “fragile” stickers are the perfect labelling solution. Our “fragile” stickers measure 45mm wide x 60mm high. 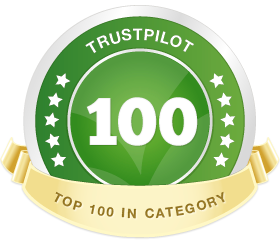 They are printed in white on a vivid red background and are supplied in rolls of 500 adhesive labels. 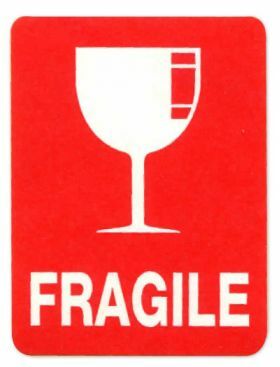 The eye-catching design consists of a wineglass image above the warning word FRAGILE. Our printed labels are made of strong, durable paper and produced in non-fade high-resolution colour. They are simple peel-and-stick, backed with permanent adhesive which sticks to cardboard, glass, stretch film, wood and other clean dry surfaces. Use these fragile stickers manually by hand or with a dispenser; they keep tidily on the roll when not needed.